Since GrADS cannot easily perform high level data analysis techniques, (barring a few complicated workarounds) it may be useful to save data so it can be used with more advanced software. It might seem logical at times to simply skip GrADS in the all together, which is fine. However, I often find it easier to use GrADS as an intermediary step as it allows me to use only the data I need, and arrange the data as I see fit. 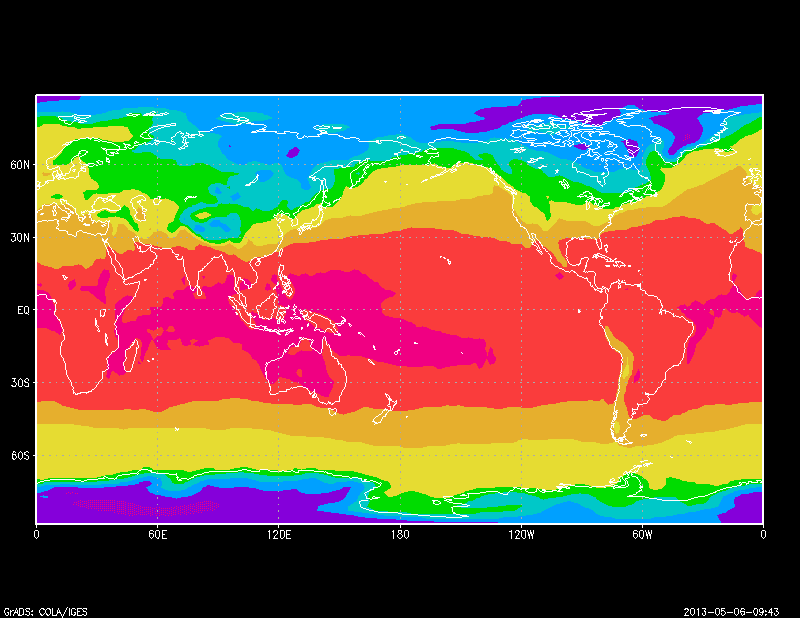 This tutorial will teach you how to save data using GrADS by guiding you through an example that will save latitude/longitude and monthly average surface temperature data from NCEP reanalysis into a .txt file. Okay, so as always we will need to start by opening the data file. For this tutorial, I will use the monthly mean 2d reanalysis product. Before we do anything else, lets see what our variable looks like. Since this dataset spans a large range of time, you can pick a time to look at; I am going to choose February,2000 as my time value. I do this by using the 'set time' (as opposed to 'set t') command. Once the time is set, simply display your variable. The resultant image is shown below. Now, that we see what our data looks like on a map, we can move on to saving it into a .txt file. Saving data from GrADS into an outside file is actually very easy, we make use of a couple of simple commands and functions to do this. The hard part is figuring out how to organize each piece of data exactly how you want it. The first thing we want to do is determine what data we would like to save, and how we would like to organize it. I have found that when writing 2d data to a text file, I like to include the x/y grid location, the lat/lon value at each grid point, and the actual temperature data. So, our data file will have five columns to contain these data. I like to know which column is which, so the first thing we will do is write header to start off our data file. This is done by using the "write" function in GrADS. Once this command is executed in GrADS the file NCEP.txt will be created in your folder with the text "X Y LON LAT TEMP" on top. Now that we have our data file started, it's time to start filling it up with data. To do this, the first thing that we need to do is tell GrADS to write our data out to the screen instead of plot it on a map. This is done by setting the output to print. In addition to that, we need to tell GrADS how to format our printed data. This is done with the 'prnopts' command. That's actually all there is to it. This script will take a few moments to loop through all of the grid-points, and as it does so you will likely see the words "unknown command 0" printed a bunch of times on your screen. I have often found it helpful to include a "say" command inside the loop, so to know where I am in the saving process. When this script finishes you will have a lot of data saved into a .txt file that can be read into any plotting or statistical program. Yes, you can do this using a very similar method to the one described here. Just don't use the loop. Use the 'set lat' and 'set lon' command to fix your desired latitude and longitude coordinates, then use the 'set gxout print' command, display your variable (you can easily convert temperature to Kelvin, or Celcius in GrADS). Then use the write() function to write out the data to a file. I got the output on commandline, works fine.. but now tje final problem is how to get this in a variable in PHP so we can use the values in calculations... Did you know this ? I'm not exactly sure what you are trying to do, are you trying to take your output from GrADS and run the ascii file into a php script? In that case it isn't too hard to load up. We want to use the $cape in other calculations so the cape of the location specified above should be connected to $cape. Is that possible ? Thanks! Presuming, you are running GrADS from a php program (i'm not sure this is possible as I am not an expert in php), you can probably feed arguments to GrADS when you run the program: e.g., "run grads -bx script.gs lat lon" or whatever command runs a program from php. Then I recommend writing the CAPE variable out from GrADS into a .txt file. One GrADS has done its thing, you can then use php to open up the .txt file and read the cape variable as $cape. At that point you should be able to do with it as you wish using php. Hopefully, this is kind of what you were looking for? I'm use grads with php, do you know how to use this in php? I have a problem, in the file.txt in the part of the result say "printing"
Hi, sorry I didn't get back to you sooner. This is a common problem, and it is pretty simple to fix! Okay, so when you set your graphics to print ('set gxout print') and you display your variable, you get output to the screen. What I did to get the variable "tmp" to write to the .txt file, I needed to grab the part of that output that is the actual value. To do this, I use the "sublin" and "subwrd" commands. Example below. In this example, the temperature is on the 2nd line, so the 2nd argument in the sublin function is 2, if it were on the 3rd line, it would be 3, and so on. Since it is the 1st word on the 2nd line, my argument for the subwrd function is 1. It looks like you are grabbing wrong line in your sublin command: which is why you get "printing" as a value. See what line your data is on, and change the sublin command to match. Thanks for this script.But i wonde how can i define a extent and extract the value for defines extent only. Because i have a dat for entire world when executing this script it is extracting the value for whoole world. Then doing a 'q dims', and I think one of the lines has the x/y dimensions for your subsetted domain. Then you can just replace the xmax and ymax values in the example provided here. That should get you started! Thanks Anonymous but in which line xmax and ymax values be replaced. But, I could not get my var in the printed file. How, I know my var line? Can someone specify how to run this code in version 2.0.2? As others have pointed out, the `write` function is not available. Thank you for the tutorial. I'm very new to GrADS. I'm following your tutorial to learn how to extract ascii data from netcdf file. Unfortunately, I failed to display the file. When I used http://monsoondata.org:9090/dods/rean2d.info, GrADS indicate 'couldn't ingest SDF meta data. I'm using the 2.0.a7 version. Could you help please. But, what can I do to make it usable for calculations from another script. Those variables I name as I read the data are gone as soon as it finishes. what i wanted is to extract spatial average and is of different times and what i got is temporal average but of different spaces. what can i do in this situation.